Promote advancements in the invention, design, and implementation of audio hardware and software. Interested in pursuing a Music Degree at Frost? The Graduate Music Engineering Technology degree (GMUE) was introduced in 1986 and has consistently placed graduates into high-tech engineering fields that emphasize audio technology, usually in audio software and hardware design engineering and product engineering or development. Our graduates have enjoyed employment at companies specifically aimed at high-tech audio such as Sonos, Avid, Universal Audio, Soundtoys, iZotope, Waves LLC, Smule, Apple Computer, Microsoft, Eventide, Bose, Shure, Dolby Laboratories, Roland, Beats by Dr. Dre, Spotify, Harman International, JBL, Analog Devices, Motorola, Texas Instruments, Cirrus Logic, and many more. Applicants to the M.S. in Music Engineering Technology typically hold a bachelor of science degree in electrical engineering, computer engineering, computer science, math, physics, or other hard sciences and are passionate about combining their love of music and engineering. A few hold dual degrees in music and other engineering/technology areas. 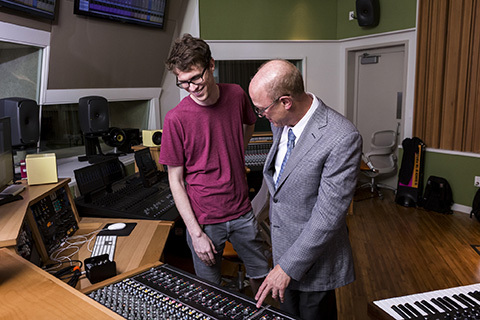 The Music Engineering Technology program enjoys being part of a world class, top-ranked School of Music, and students may become licensed to use the new $1.2 million state of the art recording studio if they wish. The two-year graduate curriculum incorporates 30 hours of coursework culminating in an original research project and thesis dissertation. Coursework includes 12 credits in advanced electrical engineering, computer engineering, mechanical engineering or computer science combined with 18 credits in advanced music engineering technology classes, thesis research and electives. The thesis project requires original work in a music engineering subject area; this independent project provides students with in-depth knowledge of a specific subject area and provides experience in technical research and in original thinking. The Music Engineering Technology program has also enjoyed participation in interdisciplinary research along with biomedical engineering, computer science, neuroscience and physical therapy. Our research facility has recently hosted students visiting from Georgia Tech, Florida International University, University of Virginia, and University of Florida. In the field of Music Engineering, we are The Makers. For more information on the M.S. in Music Engineering Technology Degree, please visit the Academic Bulletin. Those with twin passions for technology and music may find themselves interested in the field of music engineering technology. If you have a bachelor’s degree in electrical engineering, physics, math, or other STEM-related fields, and also find music to be of interest, music engineering may be for you. Music engineers make musicians sound good. The field of music engineering is both an art and a science. Many doors in this exciting field may open themselves to you after you decide to pursue an M.S. in Music Engineering Technology. This degree is also known as a GMUE, a Graduate Music Engineering Technology degree. What Will I Learn in a Master’s Program in Music Engineering Technology? As a M.S. applicant, you should already have a foundation in both music and a STEM-related field. Many M.S. applicants have undergraduate degrees in electrical engineering, math, or other related fields. M.S. applicants should also have foundational musical ability, including musical literacy and experience in more than one instrument. M.S. students gain experience in technology and have the opportunity to become qualified to use on-campus state of the art studios. Through their professors, they gain access to insider-knowledge to a wide range of music-related industries. M.S. students also learn about research and development of music technology. They learn how to design and implement both hardware and software. The goal of an M.S. degree is to deepen your understanding of all areas of the field while providing you with the opportunity for specialization. All M.S. students complete a capstone master’s research project, which involves original research related to a particular area of your interest. You will take multiple semesters of classes before you begin your thesis project, providing you with plenty of time to decide what kind of thesis topic you are most passionate about. What Kinds of Music Engineering Jobs Require a Master’s Degree? Not just anyone can walk in from the street and run a soundboard or make adjustments in audio software. All music engineers need some level of specialized training to do their jobs well. As a master’s student, you have the opportunity to spend significant time becoming an expert in the area of your choice. Music engineers work in various contexts such as music studios, rock concerts, film studios, game design studios, and more. Music engineering is a field that may require on-the-job training since each company has specific programs, approaches, and aesthetics that they prefer. That being said, students can do much to prepare themselves before they complete their M.S. degree. If you attend a school with a sophisticated studio that will grant you access, you can “get in the studio” even before you are hired. What Are the Requirements To Enter a M.S. in Music Engineering Technology? To apply for an M.S. in Music Engineering Technology, you will need to have completed a bachelor’s degree. Many students have degrees in math, physics, engineering, or other scientific fields. When you apply, you will need to include the application components the university requires of every student, which may include GRE scores, grade transcripts, letters of recommendation, and a statement of purpose. In addition, your program may require you to submit a portfolio. The purpose of this portfolio is to provide evidence to the admissions committee that you’ve already begun building your skill set in the field. Make sure to check with the department at your specific school to find out more information about what they will specifically require. Some of the most exciting advances in modern music technology are due to the diligent work of music engineers. The best engineers have excellent aural skills and perfect timing. They also have the ability to cope with long hours and tight deadlines. Just as it take a lot of practice to be a musician, it takes a lot of practice to become a music engineer. As you progress through your degree, you will have the opportunity to talk with many engineers who’ve taken all sorts of career paths. Discussing the in’s and out’s of the field with those already working in it will give you special insight that cannot be gained through reading a book. Just How Important Are Aural Skills? Developing a good ear is the beginning of a journey to becoming a music engineer. It is true that every year, there are an increasing number of tech tools that help engineers achieve their goals. That being said, it’s still up to the human ear and the human brain to have the last say about whether something sounds right. Excellent sound can advance a movie plot, set a mood in a room, or create an atmosphere at a concert. As the sound engineer, it will be up to you to make the adjustments needed to reach your team’s collective goal. How Do I Find the M.S. in Music Engineering Technology that is Right for Me? An M.S. in Music Engineering Technology can deepen your appreciation for music while it prepares you for the next step in your career journey. Before you pursue a program, it’s important to do plenty of research to ensure that you’re picking the best program for you. With an established history of remaining on the cutting edge of music engineering technology, the Music Engineering Technology Department in the Frost School of Music at the University of Miami has trained generations of recording engineers. At Frost, you will have the opportunity to work in a $12 million recording studio, matriculate under the tutelage of esteemed instructors, and get hands on experience even before you graduate.